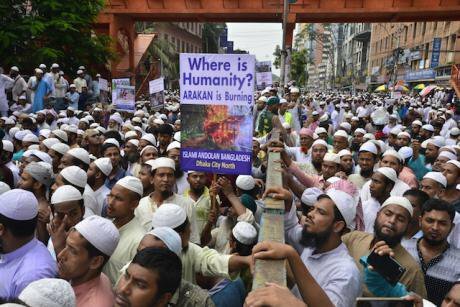 (Or, why is the world allowing the Rohingya to be slaughtered?) There is a genocide happening before our eyes. If only we can bear to look. Rohingya Muslim refugees wait for relief on the Bangladesh side of the border after fleeing violence in western Myanmar, Sept. 11, 2017. NurPhoto/SIPA USA/Press Association. All rights reserved.My heart has broken. Many times, in many ways over the past twenty days. It has been splintered, hammered, shattered, parched, starved and numbed beyond recognition. As a human rights advocate who has worked on the Rohingya issue for about ten years, I have experienced my fair share of despair in the face of the many atrocities this community has endured. Through my work, I have become familiar with an ever-growing list of violations against them, which have increasingly convinced me that the Rohingya – widely recognised as the most persecuted minority in the world – are the victims of crimes against humanity and genocide. Not a conclusion I arrived at lightly, but one which I have grappled with over time. Even so, nothing prepared me for the last twenty days. I lack the vocabulary to process, let alone describe what has been happening in Rakhine state. Such extreme expressions of hatred, bigotry and violence are beyond my comprehension. The thought of being at the receiving end, beyond my imagination. What words do I know to capture the agony of a two-year-old being burnt alive, her parents forced to watch. Or a teenager gang-raped by a horde of men, just after her father has been shot point blank? How can I even begin to describe the sheer fatigue of a man forced to walk for a week, gun-shot wounded, without any food, while carrying his grandmother? Or the all-encompassing loss of a woman – home burnt, family killed, dignity torn to shreds? Can my imagination be wild enough to understand the courage of a mother who gives birth to her baby while fleeing blood thirsty genocidaires, or the desperation of another whose starving, traumatised and fatigued body cannot produce breastmilk for her infants? What about the nine-year-old child who overnight became the sole protector of her one-year old brother, and had to carry him across borders to safety? Or the disabled man who crawled on all fours for days to escape his persecutors? Or the woman, who within touching distance of the relative safety of Bangladesh, treads on a landmine planted by the Burmese army? What words in what language can describe the sense of betrayal that must be felt by the countless IDPs who are starving to death because international humanitarian aid no longer reaches them? Possibly over 400,000 refugees in twenty days. 20,000 a day. Almost a thousand an hour. Each of them scarred, starving, traumatised, hunted, degraded, persecuted, fatigued. Each of them denied their identity, branded liars, systematically persecuted, deemed too ugly to be raped by the Burmese state, its propaganda machine and murderous mobs. 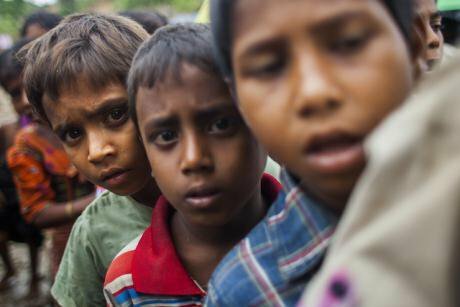 The Rohingya have been beaten down, detested, dehumanised, destroyed. Over and over and over and over again. There is a genocide happening before our eyes. If only we can bear to look. The Rohingya genocide didn’t begin on 25 August 2017, or September 2016, or even June 2012. It has been steadily going about its business as the world went about its own, for many decades. Under international law (the UN Genocide Convention and the Rome Statute), genocide is defined as killing, causing serious bodily or mental harm, inflicting conditions of life calculated to bring about physical destruction, imposing measures to prevent births or forcibly transferring children of a national, ethnic, racial or religious group with the intention of destroying the group in whole or in part. For over 40 years, the Burmese state has been engaged in wholescale persecution of the Rohingya; denial and deprivation of their nationality; denial of their history and identity; restrictions on marriage and children; forced malnutrition and forced labour; restrictions on education, healthcare and movement; arbitrary arrests and killings; all with the cumulative intent of denying their participation in society, driving them out and destroying them. This systemic and structured persecution has been interspersed with waves of acute violence carried out by state and non-state actors alike – in 1978, 1991, 2012, 2015; and has been fuelled by the most vitriolic propaganda campaign which has brainwashed a country into reviling and fearing the most vulnerable and downtrodden among them. For too long, the calls of human rights actors have been ignored, dismissed, muted. For too long, other labels have been used so as not to offend. ‘Inter-communal violence’ cried the world in 2012, when the state apparatus lined up with Rakhine extremists to kill, plunder, drive out and displace hundreds of thousands of Rohingya: ‘genocide’ and ‘crimes against humanity’ whispered the activists who saw a deathly 40-year-old pattern. ‘Inter-communal violence’ cried the world in 2012…: ‘genocide’ and ‘crimes against humanity’ whispered the activists who saw a deathly 40-year-old pattern. Genocide never happens in isolation, nor is it inevitable. It is denied, enabled, enforced; through lies, complicity, counter-narratives, propaganda, turning a blind eye, weighing human life against economic and geopolitical gain. For genocide to be possible, the right environment has to be carefully cultivated over many years. For it to actually be carried out, the rest of the world has to be too divided, conflicted, selfish or indecisive to – even for a short moment in time – come together to protect those under fire. In the Rohingya genocide, we see all these ingredients and more. The arbitrary denial and deprivation of Rohingya’s Burmese nationality has played a pivotal role in how they are perceived and treated. Rohingya have faced targeted exclusion and persecution at least since the 1970s; but it was the 1982 citizenship law which entrenched their statelessness. The Rohingya were denied citizenship because they are an unwanted minority. Once made stateless, this was used to reinforce the dominant narrative that they are not from Burma, that they are illegal immigrants from Bangladesh. Their statelessness was drawn on to deny their identity (they are Bengali, there are no Rohingya) and their history. It became the justification for the suffocating restrictions imposed on them. It mattered not, that there was no international law or historical basis for any of this. The statelessness of the Rohingya, their resultant treatment and the surrounding discourse, paved the way for what was to follow. Myanmar justifies its brutalisation of the Rohingya, by pointing to the ‘jihadist’, ‘terrorist’ ARSA. It is a convenient narrative that feeds off a wider global islamophobia. The state – and particularly the military – is intent on painting the Rohingya as violent extremists for two reasons. First, to attribute state crimes against the Rohingya to the Rohingya themselves. Second, to garner domestic and international support for the terror that the military is unleashing. Aung San Suu Kyi is increasingly criticised for her position on the Rohingya. However, many of these criticisms still flatter. She is implored to break her silence. She is called upon to exercise her moral authority to ease the Rohingya pain. She is sympathised with for being in an impossible position. She is given more latitude than a slowly turning oil tanker. Her pedestal may not be as shiny or tall as it used to be, but world powers are still propping it up. She shields their inaction, as she shields army action. The ever-diminishing sense is that things cannot be so bad if she has not spoken out. There is however, another way of perceiving her. She has not been silent. She has used her voice to stoke hatred against the Rohingya, to ridicule the testimonies of survivors of genocide. To accuse humanitarian actors of colluding with terrorists. To justify the denial of the Rohingya identity. she is only silent in her unwillingness to speak the name ‘Rohingya’. And so, she no longer has any moral authority to speak of. She is a failed leader, who is watching her country burn, her people turn against their neighbours, her military perpetrate the most unspeakable and atrocious crimes and who has taken a calculated and cynical decision to stand with the oppressors. World powers are still propping it up. She shields their inaction, as she shields army action. These oppressors are first and foremost, the Burmese military, which is led by Senior General Min Aung Hlaing. The testimonies of victims have consistently and repeatedly identified the military as the primary perpetrators. Rakhine mobs have also played a crucial, violent role. But the Burmese military, which still controls the country and which has set itself the objective of finishing its unfinished business from 1942 is the all-powerful hand that is orchestrating the unspeakable violence. Pushing the Rohingya out is not only ideological, it is also economic. Plans for a special economic zone in Maungdaw are already in the public domain. Ownership of burnt land reverts to the state. Natural gas pipelines and the extractive industries are lucrative beyond belief. The military, stands to profit immensely from its crime against humanity. In the absence of a strong presence of media or independent monitors, accusations of fake news are commonplace. The propaganda front is as important as ever, to whet the appetite for genocide and to deflect and deface any critical attention. The same state which denied UN investigators entry and does not allow journalists free access to the affected area, is seeking to benefit from the resultant near impossibility to verify testimonies. All news that exposes its hand is deemed to be fake. The state is also producing its own fake news, forcing those under its control to enact burnings, so the Rohingya can be blamed for committing mass harakiri. It is terrifying that despite the sheer weight of evidence, countless Burmese choose to believe the state version, and even international actors do not disregard it completely. And so, legitimacy is being given to the lies that perpetuate genocide. This crisis has yet again highlighted the failures of the UN to rise above partisanship, bureaucracy and ineffectiveness, despite the consistent and increasingly louder warnings and pleas of its Human Rights Office. The international community appears finally, slowly, to be being jostled out of its slumber of complicity and indifference. Too slow to prevent the unimaginable suffering of so many, and it is still unclear if any decisive action will be taken. Pushing the Rohingya out is not only ideological, it is also economic… The military, stands to profit immensely from its crime against humanity. It is unthinkable that the Burmese military continues to benefit from arms trade and training from many of the world’s super powers. That even after the genocide began, they were mooted as a viable option to don the blue helmets of UN Peacekeeping forces. The genocide of the Rohingya has proven without doubt and at great cost, that the world was too hasty to lift sanctions on Myanmar and congratulate it for its democratisation gains, while lining up to do trade with the mineral rich country. Such are the times we live in though, that such proof alone isn’t enough to guarantee a stronger, more principled international response. 'Islami Andolan Bangladesh' march to Myanmar Embassy to demand, Stop genocide on Rohingya in Dhaka, Bangladesh, on September 13, 2017. NurPhoto/Press Association. All rights reserved.